Arab artists seeking to stage new and experimental work in the performing arts have, until now, sought financial support primarily from international sources but also from a few local foundations. Most performers and theatre-makers face critical challenges in accessing financial resources, challenges augmented by the fact that they work, in general, in an unstable environment within very modest conditions. The lack of cultural policies in the Arab world has impacted negatively on every component of the cultural scene, with theatre-makers and performers equally influenced. Institutionalizing, clustering, and recognizing the economic value of cultural activities have never featured highly on state agendas in countries across the Arab region. Because of this lack of government support we have seen an emphasis on individual creativity, and consequently a flowering of emerging independent art scenes based on individual initiatives, mainly led by up-and-coming cultural leaders and suffering from financial deficits, rather than the development of effective and self-sustained institutions. Alma Salem, MENA Regional Arts Programmes Manager at the British Council, believes also that: "Still it would be wrong to assume that all the dynamism of the creative sector comes from sole traders or micro-businesses. Especially if we include the Gulf region in the equation, and more specifically in the Visual Arts and Music industries where we witness that larger businesses are overwhelmingly concentrated in one part of the value chain – i.e. distribution – while the small and micro-businesses dominate the top end of the supply chain – the creative end. One major element to develop this shaky environment is the role that the relatively small investments in developing cultural relations between the Global North and South play in the growth of small creative businesses, which is encouraged and supported by international agendas and funds aiming to support development of the Creative Economy in our region. " In Syria, for example, The Swedish International Development Cooperation Agency partnered with the Damascus Opera House to fund five theatre performances by young people in 2009. The General Authority of the Damascus Opera House in turn offered direct financial support to certain productions. 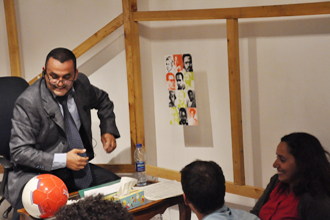 A few of the more daring contemporary theatre productions have also received support from these and other donors, such as the Arab Fund for Arts Culture who supported recently the production of Pinter’s the Home coming directed by Oussama Ghanam in 2013, Al Mawred Al Thaqafy (Culture Resource), and the Hivos Fund based in the Netherlands. 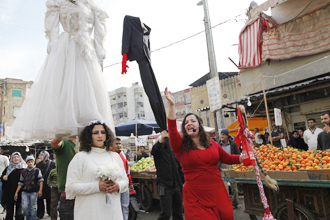 Dario Fo’s A Lone Woman, directed by Amal Omran in 2010, debuted at the Opera but was later banned from participating in the 15th edition of the Damascus Theater Festival due to its bold nature. 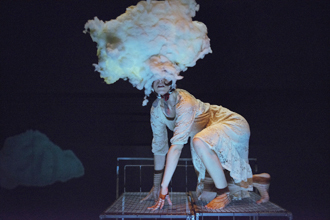 These productions, which have widened the horizons of discourse in the theatre, have revealed that the ceiling of censorship needs to be repaired and the empty space below it filled before it can be lifted. Mey Sefan is a choreographer, dancer and cultural organizer. Since her return to Damascus, she has been working with the High Institute of Dance in Damascus. She formed Tanween for Theatrical Dance in Damascus, she is the founder and director of the Damascus Contemporary Dance Platform DCDP. During her work in Syria between 2003-2011, Sefan faced three challenges in dealing with financial needs: fundraising for her own performances, for the workshops of DCDP, and for the dance students’ workshops. Although the three types of project have different approaches, the routes to raising funds are the same: asking foreign cultural councils, cultural departments at the embassies, and donors. In Egypt, independent artists are faced with many challenges that are not confined to funding alone. They lead very precarious lives marked by financial instability and social pressure. Artists deal with uncertainty about the future due to their unstable economic situation and their fight for social recognition; in terms of funding, they are obliged to carve out their own paths in order to follow their passions and lead their lives as artists. Amina Abodoma, a member of Teatro Eskendria which is a very promising art center and social hub, believes "there is a big problem in public funding, principally because although it exists, it lacks transparency about how funding schemes are managed, in terms of announcing calls, declaring finance, diffusing deadlines and specifying the allocated genres and formats for each project. Secondly, it was not until very recently that independent artists could benefit from these so-called funding schemes, as independent artists were always known for their leftist inclinations in opposition to the prevailing political system of the government during the reign of Mubarak. Therefore, independent artists were deprived of these benefits, which were instead given to right wing artists treading government lines." However, it is worth mentioning that Egypt’s foreign cultural relations office, has played a large role in supporting the independent scene from 2007, providing the only source of funds for some artists (especially musicians) who received travel grants to perform abroad. Public funding in Egypt is channeled through only one source: the Ministry of Culture and all the state-governed establishments affiliated with it. Other sources of funding include the foreign cultural centers as well as independent cultural organizations; the most vibrant and effective of these is the Al Mawred Al Thaqafy (The Culture Resource), which takes over a large part of the role that should be played by the ministry and leading on very regionally role at the same time. The majority of funds available to Egyptian artists comes from these organizations rather than from the state and this is almost the same scenario at most of the Arab countries. It is worth mentioning that in recent years artists and cultural practitioners have started to show a new entrepreneurship in their thinking, attempting to square their talents with financial imperatives in order to supporting themselves, at least in part. The prevalent situation of socio-economic chaos in Arab counties is very blurry and nobody can predict at this stage what may come out of it. However, if something positive is to be mentioned, it is the fact that over the last 2 years the independent arts scene has flourished and the alternative media has played a significant role in giving visibility to the artists involved, who have been well-received by masses of audience members looking for change in every aspect. 2013 2 2: Egypt, Lebanon YATF production grants are between 2000 and 5000 Euros each year, It give an average of 3grants per call,and it has 3 calls a year. He participated at many workshops and works as a cultural trainer with many organisations. He published and directed his text "Mrs. Ghada threshold’s pain" in Beirut, and he was a member of selection committee of "Arab Contemporary Dramaturgy" to select 9 Arab texts to be published in French, organized by IEVP 2012. Abdullah was awarded first place in the 19th Mohammad Teymour Competition for Theatrical Creativity for the text ‘Damascus-Aleppo’ which was also shortlisted as a finalist in the BBC competition for best translated work in 2008, He is a founding member of ’Ettijahat Independent Culture".